The date for the induction of our new Vicar , the Rev. Julie Gittoes, has now been agreed for Wednesday 19th June . Please continue to pray for Julie as we make ready for an exciting new chapter for our parish . In December our Parish Representatives, together with Bishop Rob and Archdeacon John, interviewed two candidates for the post of Vicar here at St Mary’s and Christ Church. We are very pleased to be able to tell you that the Rev’d Canon Dr Julie Gittoes has now been appointed. Bishop Rob’s message is below. Julie will continue in Guildford until Easter on account of her current commitments at the University, and the date of her Induction will be announced in due course. 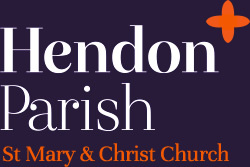 Please pray for Julie as she now prepares to move to Hendon’. Since 2012, Julie has been a Residentiary Canon at Guildford Cathedral. In post she has been developing the Cathedral’s educational work, including deepening partnerships with the diocese, engaging in public dialogue, line-managing the schools and family learning department and re-establishing the Cathedral’s programme of art exhibitions. At present she is on secondment to the University of Surrey as Acting-Anglican Chaplain. She grew up on the Welsh/Herefordshire border. She took a year out to go to secretarial college before going to Durham to read theology. She went on to train at Westcott House in Cambridge and completed her curacy and following incumbency in the London Diocese. Julie has taught doctrine for St Augustine’s College and Guildford's Local Ministry Programme and is a member of the Society for the Study of Theology (and chairs the Church, Theology and Ministry Seminar). She continues to engage in theological research and writing on ecclesiology, sacraments and the work of Dan Hardy; and her current areas of theological interest include singleness, cathedrals and the nature of power. She published her PhD “Anamnesis and the Eucharist” (Ashgate 2008), co-edited "Generous Ecclesiology: Church, World and the Kingdom of God" and contributed an essay to "Thinking Again About Marriage" (SCM 2016). Her other interests include politics, film, theatre, art and fiction - all of which make their way into preaching and teaching. She runs/cycles and enjoys going to circuit training; and has been attempting to re-learn the violin and piano! The process of finding a new Vicar was a challenging task. The PCC was very conscious of the need to find the right person to lead and develop us and we thank everyone for their support and prayers during this time. We also thank everyone for their input and help with the Parish Profile and preparations for the interview day. We look forward to Julie joining us once she has served her period of notice at the Cathedral, taken time for reflection and refreshment and dealt with the practicalities of moving back to London. Please keep her in your prayers.